A guidebook for lovers of London, of Jane Austen – or just a good walk. 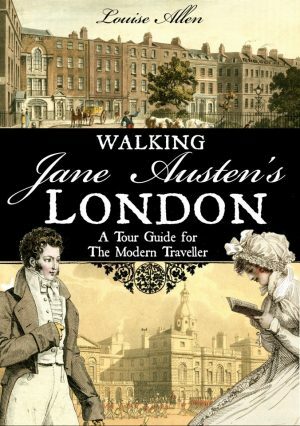 Walking Jane Austen’s London contains eight new walks to appeal to Jane Austen enthusiasts, history buffs and anyone who enjoys exploring London. It is lavishly illustrated in colour with detailed maps, original prints of the period and photographs. ‘My Father will be so good as to fetch home his prodigal Daughter from Town, I hope, unless he wishes me to walk the Hospitals, Enter at the Temple, or mount Guard at St James.’ (Letter to Cassandra Austen. 18th September 1796). Jane Austen was born in 1775 and died in 1817. For almost her entire adult life London was the capital of a country at war with France (1792-1815), with only brief intervals of peace. And yet it flourished, the greatest trading city in the world, with a population growing at a startling rate. New districts pushed the boundaries of London ever outwards with their fine streets, fashionable squares and spacious churches. The Port of London brought in goods from all over the world to fill the shops with a variety of wares never before seen on such a scale. Wealth fuelled by rapid industrial development and agricultural improvements poured into the capital. Much of this London remains to be discovered by the explorer of today and it can seem very familiar – great public buildings, elegant streets, green parks. And yet the London Jane Austen knew, and incorporated so confidently into her novels, was very different from the London we know now. Kensington, Knightsbridge, Hampstead, Islington were all separate villages. Green fields and market gardens still resisted the fingers of development that pushed between them. Vast slums and rookeries existed cheek by jowl with fashionable districts. The only policing, apart from the handful of Bow Street runners, was by parish constables and private watchmen. Prisons of almost medieval squalor were scattered through the city. The civic improvements of the later nineteenth century were yet to come – London Bridge was still the crumbling medieval structure of the nursery rhyme, shorn of its shops and houses, Nash’s great Regent Street scheme had yet to begin and the Thames ran unconfined by the Embankment. Gas lighting was a novelty in a few streets, privies were still cleared by night soil men, vast herds of animals were driven daily through the streets to reach the markets and thousands of horses filled the city with the noise of their hooves and mired the streets with piles of dung. The air was thick with coal smoke from a million chimneys. Jane never lived for more than a few weeks at a time in London, but she passed through it often on her way to visit friends and family and she stayed on many occasions with her banker brother Henry. Her publishers were in London and her vivid letters are full of detail about shopping expeditions and visits to galleries and theatres. Despite her protests – ‘…the truth is, that in London it is always a sickly season. Nobody is healthy in London, nobody can be.’ (Emma) – her excitement in coming to Town shines through. ‘Here I am once more in this Scene of Dissipation & vice, and I begin already to find my Morals corrupted,’ she jokes to Cassandra in August 1796. The eight walks in this book explore three Londons –London at the turn of the eighteenth and nineteenth centuries, the London of Jane Austen’s personal experience and the London of her novels. They are organised east to west and will take you from grand aristocratic mansions to squalid prisons; from the theatres where Jane admired the great actors of her day to the place where she found ‘a great many pretty Caps.’ Following these routes we tread in the footsteps of sulky Lydia Bennett, heartbroken Marianne Dashwood and lovers Harriet Smith and Robert Martin.